There’s something about mice with swords, fighting battles, living lives in complex, visibly-medieval societies in a world full of other rodents and creatures with similar societies that is charmingly appealing, if not downright awesome. Mouse Guard: Legends of the Guard, Volume 2 #1 is just such a comic, following in a long tradition of rodents in literature, comics, and film, from Stuart Little (1945) and its movie (1999), to Mrs. Frisby and the Rats of NIMH (1971), its movie version (1982), to the Redwall series (1986), Stan Sakai’s Usagi Yojimbo (1984), and to Image’s The Mice Templar comics (2007). Rodents seems to be culturally recognized around the world in mythology and folklore, partly because some of them learn quickly and can be trained, so they make great pets and cuddly companions (and the most vicious guardians, as Monty Python taught us). Wikipedia even has lists of fictional rodents in literature, comics, and animation! Mouse Guard is a comic series begun in 2006 by David Petersen, who both writes and illustrates the series for Archaia Studios, and is an Eisner Award-winning publication. 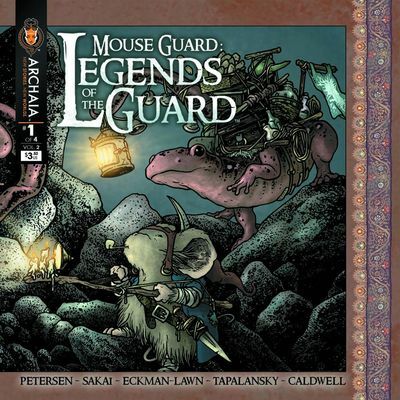 The Legends of the Guard imprint is an anthology series based in the Mouse Guard world, which allows other authors and illustrators to tell their own stories with Petersen’s creation. This issue is the first in the second volume, and features stories by Stan Sakai (“Autumn Tale”), Alex Eckman-Lawn and Nick Tapalansky (“Leviathan”), and Ben Caldwell (“A Bone to Pick”). These three stories are embedded rather sweetly within a larger narrative drawn and written by Petersen himself. The premise: a bunch of mice have been lodging at a tavern, all of them racking up large debts to the owner, who offers that whoever tells the best story will have their debts cleared. This provides an easy entre into the Mouse Guard world, and though I’ve never read a single Mouse Guard issue before I felt right at home with the tales, each of which was tenderly written and could easily be understood by children but which are still mature enough in thematic content (or cute silliness, as with “A Bone to Pick”) to be appealing to adults. The art for each of the three stories differs from beautiful watercolor-esque panels by Stan Sakai (47 Ronin, Usagi Yojimbo) to the more sketched, ethereal look of Eckman-Lawn’s illustrations, and finally Caldwell’s very fun, yet still complex art in the final story (reminiscent of The Secret of NIMH animation, actually). The pacing between stories and in the Petersen interludes allows for each story to be satisfactorily told, with enough interest created to desire just a little (or a lot!) more from each story-teller. This is my first experience with Mouse Guard, but I have to say that I’m not only looking forward to delving into Petersen’s rodent world, but I’ll for sure put the next issue of this anthology, Legends of the Guard, Volume 2 on my pull-list. If you’re a fan of any of these artist, love rodent stories, or just want something fun to read and beautiful to look at, then this is the book for you.